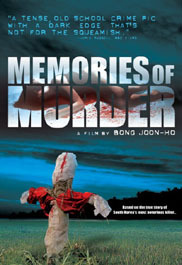 Memories of Murder is a Korean mega-blockbuster based on the true story of the country's first-even serial killer. In a small town outside Seoul, over the course of six years, 10 women were raped and murdered in a 2km radius. Korean society's first serial killer took the lives of 10 victims, ranging from a 71 year-old grandmother to a 13 year old schoolgirl. At a time in Korea when there was no profiling mechanism, nor any idea of preserving the crime scene for forensic investigation, Memories of Murder is a complex and riveting tale of Korea's first serial killer and the men charged with their capture.